Wisdom teeth, or third molars, usually appear around age 18. Eruption may be straight, crooked, or impacted. Even if these molars come in straight, they may need to be extracted due to a lack of space and an inability to keep them cleaned and maintained. Please read and view the images below for the various types of erupting patterns and impactions. The lower tooth, in the image to the right, is partially vertically impacted. 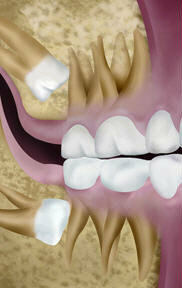 This means that part of the tooth is above the bone and visible in the mouth, and part of it is submerged in the bone. This tooth could still erupt properly as the tooth next to it is not in its way. The upper tooth is fully vertically impacted. This means that the entire tooth is submerged in the bone. If no tooth movement is shown after a few years, then we know that the teeth are impacted and should be considered for removal. 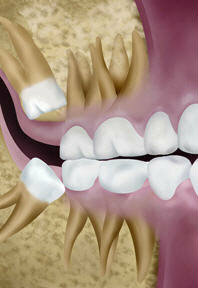 This tooth could still erupt properly as the tooth next to it is not in its way. The lower tooth, in the image to the left, is partially mesially erupted. This means that part of the tooth is above the bone and visible in the mouth and part of it is submerged in the bone and is it tilted mesially, which means it is tipped toward the front of the mouth. This tooth will not likely erupt properly as the tooth next to it is in its way. These teeth typically need to be extracted because the bacteria that collects under the gum tissue are almost impossible to clean, which can cause an infection. The tooth next to the wisdom tooth can also decay due to the wisdom tooth. The upper tooth is fully mesially impacted. 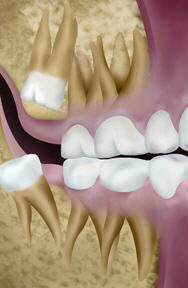 This means that the entire tooth is submerged in the bone and is tipped toward the front of the mouth. These teeth can be observed for a few years but it is best if they get removed especially if other teeth need to be removed. The lower tooth, in the image to the right, is partially distally erupted. This means that part of the tooth is above the bone and visible in the mouth, and part of it is submerged in the bone and that is it tilted distally, which means it is tipped toward the back of the mouth. This tooth will not likely erupt properly due to a lack of space toward the back of the jaw. These teeth typically need to be removed because the bacteria that gets under the gum tissue is almost impossible to clean, which then causes an infection. The upper tooth, which is indicated by the yellow arrow, is fully distally impacted. 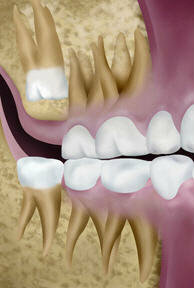 This means that the entire tooth is submerged in bone and is tipped toward the back of the mouth. These teeth can be observed for a few years but it is best if they are removed. Both of the teeth in the image to the left are horizontally impacted. This means that the tooth is perpendicular where they should be. This tooth will not erupt properly since there is no place for them to go and there is almost no chance that they will be guided into proper position in the mouth. These teeth typically need to be extracted. They can be observed for a few years, but it is best if they get removed.